Unlike Hansel and Gretel, whose mother tried to starve them and then lock them out of the house, Mother Longenecker provided well for her children and left behind, not white pebbles or bread crumbs, but hand-written notes tucked away to tag her heirlooms. Each note provides a designated recipient sometimes with a bit of family history. 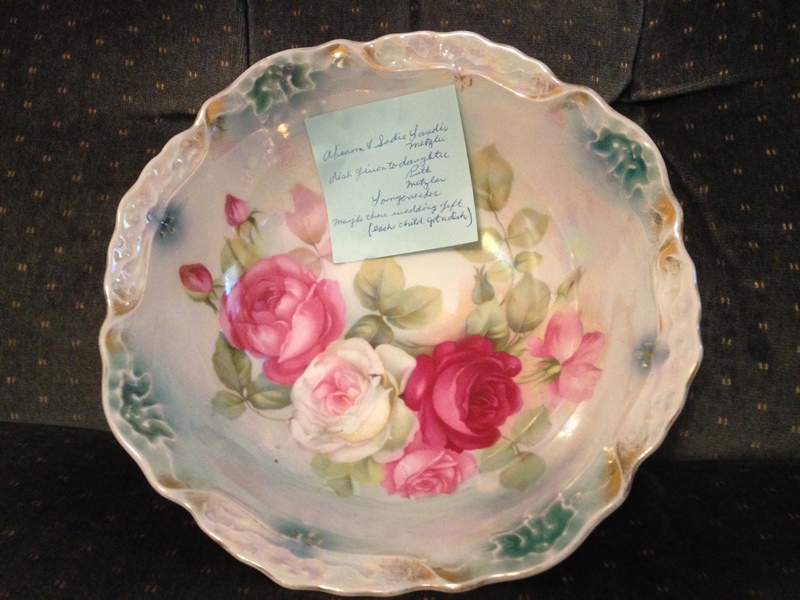 One of Mother’s grand-daughters will get this dish no doubt and will know its provenance, which would probably be lost forever, without the note . 2. Keepsake from Mother’s Sunday School teacher at Erb Mennonite Church with teacher Mrs. Kathryn Bomberger. 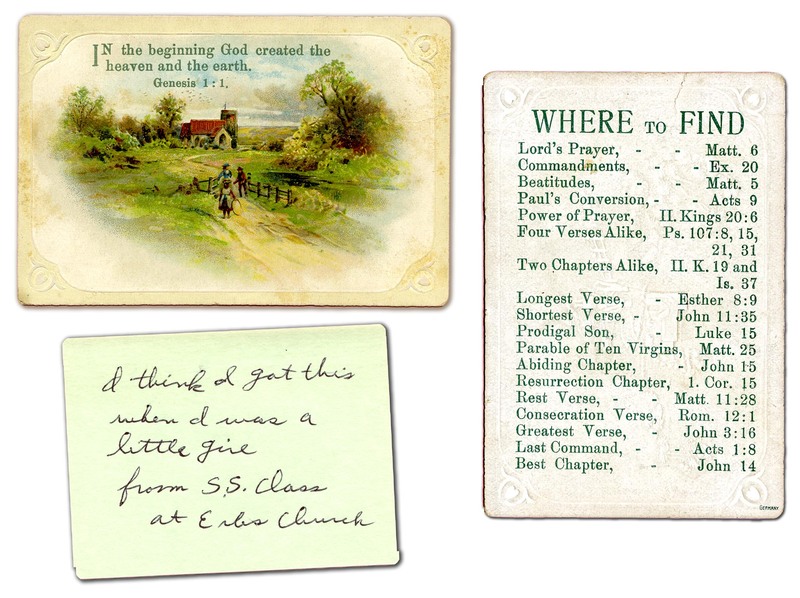 The note emphasizes the biblical account of creation found in the book of Genesis and on the reverse side a quick guide to prayers, parables, and verses commemorating sacred events. You can find more of the history of the Erb Mennonite Church here, including its roots in the Swiss-German Anabaptist culture. For many months now, this photograph has served as the banner on my Facebook page. When I posted it, I was totally unaware of Mother’s imminent death. Now I am loath to replace it with a different photo. 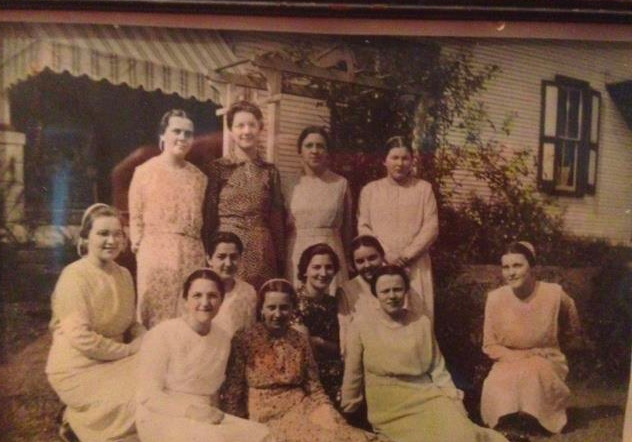 All the ladies are plain here, except the smiling woman seated on my mother’s left. I imagine this shot was taken after Sunday dinner at the home of the teacher. According to my notation in red in 1991, Annie Metzler gave this set to my mother, who notes in her own hand-writing that she was Mom’s step-mother. This vintage piece is hand-stamped Made in Japan, possibly created during the Golden Age of Japan’s trade with the United States in the 1921-1941 era. Mother had “secret smarts” that we became more aware of recently, revealing her keen interest in the continuity of memory as she passes both artifacts and notes on to the next generation. Do you have any family notes like these? Do you tag things you want to pass on? Here’s where to share your wise observations . . . Previous postPlaying Tag, The 2014 WIP Tour: Who’s Next? I love the photograph! Do you know when it was taken? I assume you mean the one of my mother and her Sunday School friends. Mother was born in 1918 and married in 1940, so my best guess is the mid to late 1930s. I’m going back up to PA next week, so that would be a good time to check whether or not there is a notation on the reverse side of this photo. I’m hoping today finds you closer to publication of your “Everyday Life . . .” tome. Maybe you have met your deadline already. I sent in the manuscript–all but the documents section–this morning! Congrats! Kudos! Brava! All that . . . now give yourself a break if you can un-lax, detach – hard to do after such immersion. Kathy, it’s nice to meet again this way. I’m glad this post is a reminder to tag your valuables too. My children insist they don’t want any of my “old stuff,” but since their grandmother’s passing, they have felt differently about her mementos. I imagine time will change their minds about my things too. Thanks for reading and commenting today. Marian — “Secret smarts,” indeed! Your mother was downright brilliant in planning ahead. And from my perspective, her handwritten notes are the real treasures because they evidence her love and thoughtfulness. You are right as always, Laurie. 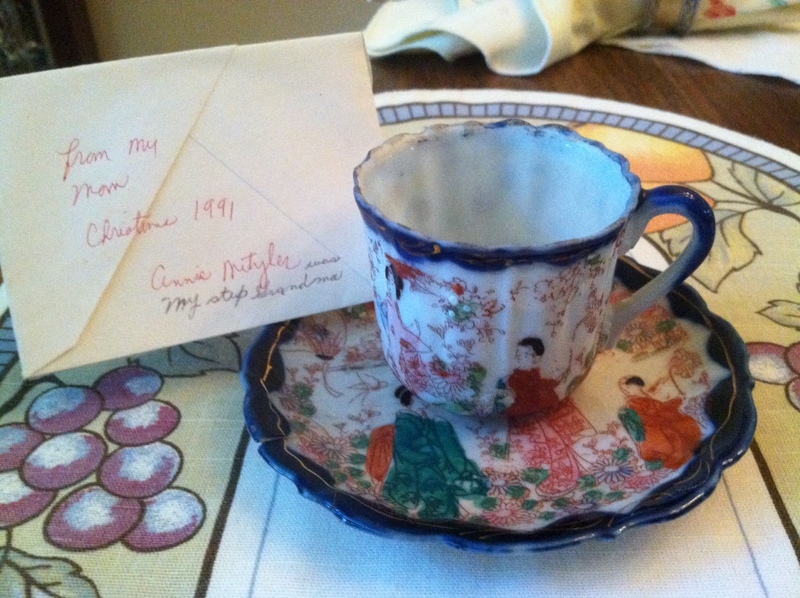 Thousands of pretty dishes and fancy cups are tucked away in china cabinets and attics, but only one Mother with an eye to the future of her prized possessions. Your mother certainly had good organizational skills, which she has passed on to you. You have a great assortment of items to cherish: Crocheted dining room tablecloths, especially, are lovely. You are lucky to have one. I have not thought of Duz detergent in years. Ha! That company may have been swallowed up by Dawn! Oh, Marian, this post was a lovely wave of nostalgia for me. I still have a beautifully embroidered set of pillow cases from my Brethren grandmother. They remain perfectly folded, wrapped in tissue paper and stored in a box that something else came in from Montgomery Wards. I haven’t used them in 36 years–my grandmother gave them to me at the birth of my daughter–but I’ve opened the box and read the sweet note penned in my grandmother’s distinctive handwriting many times. My daughter and I have agreed this box will be hers when the time comes, and then when the time comes it will be passed on to her daughter. Another parallel experience we share, Marylin. As we went through one of my mother’s chests, we found several pillowcases she was keeping “just for nice” as she would say. Now I think, “Why didn’t she use them herself and enjoy a bit of pampering. That your Grandmother’s embroidered pillowcases ensconced in tissue with a handwritten note remain intact sort of puts them in the artifact category with your daughter a lady-in-waiting. Sweet! In a close-knit culture such possessions and the provenance surrounding them is valued highly. Mother reflects that. And I suspect many of the ladies pictured above would have done the same thing. So now you know, Debby! And don’t I know it. So grateful! My son has his great, great, great-grandmother’s bed. I had my grandmother write the provenance and laminated it so it will be preserved. It was bought for $1.50 in Nashville, TN shipped up the Cumberland River and off loaded at Canron, KY. It is more precious now because my grandmother died in 2012. That bed must be old, old. And who knows the life it had before your great, great-grandmother received it. What stories it could tell – ha! Michael is so fortunate to have it now and the story that comes with it! Marian. Once again you have posted such a great idea that we should all do. Mom was very organized. The picture and treasues are beautiful. I remember one year she told me to help myself to a knickknack in her china cabinet. At the time I didn’t realize her offer and what she was doing. Yet I looked and picked Amish salt and peppers – they were cute. One day cleaning the table they fell and broke. I was so upset more because they were so cute, and not who gave them to me. I called mom and told her how bad I felt. She said, “Its ok. I’m sure you can find something else in the cabinet.” Well I never did. Looking back, she was giving me a part of her. How I wish I would have realized that back then and I would have taken better care. I’m going to start doing the same putting notes on things, so my children would know and who I want to have what. Thank you. I always learn something new from your blog. Thank you, Gloria, for reading and sharingg your own story. Mother was a kind soul, always giving, giving. I think we have some of her cookware reserved for you when you return to PA. Happy to hear you have been encouraged to tag your precious items too. 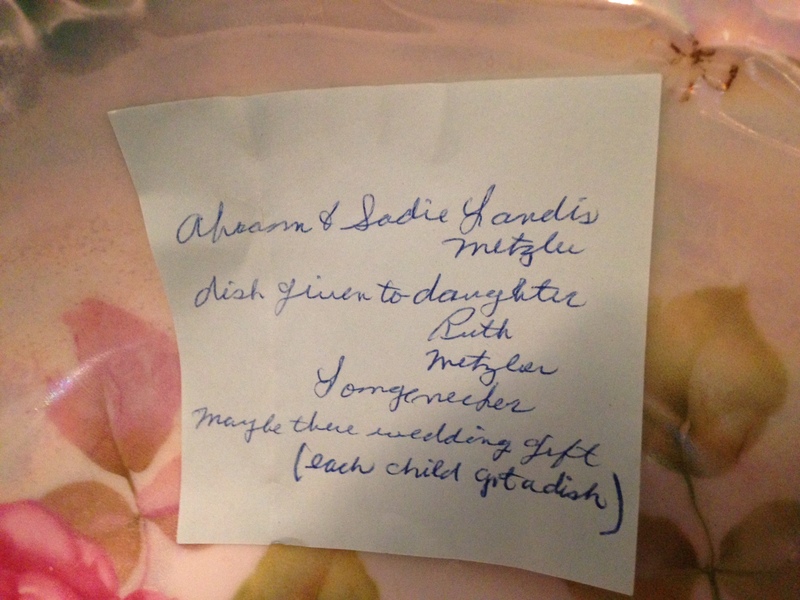 My mother-in-law and my father-in-law’s mother simply wrote names on the back of items. My mother has inventoried the whole house and put it on a spread sheet…yes, she’s thorough that way. It’s nice to know affairs are in order so all we have to do is carry out their wishes…no guessing. However, recently a neighbor, a very good neighbor of my MIL came by. There was a crystal decanter that I couldn’t identify. When I asked our neighbor, she gushed “It’s a water decanter.” She held it so admiringly, and told me more about it, so I said, “Please take it. I know K would want you to have it.” I’m so glad that water decanter found its way into the home of my MIL’s good friend. Have a nice week. Your mother’s foresight is simply amazing. Sorting through a loved one’s items takes extra time if there is deliberation over each piece. It sounds that won’t happen to you and your siblings. The story of the water decanter is touching. Even before her death, Mother gave things to those who admired a special item. Now, if friends or family visit and seem interested, we make similar offers. Your anecdotes, always appreciated, Georgette. No time like the present, Anita. Maybe you can do a little each day. One day – presto, it’s done! What a lovely idea. We have a lot of things to sort through at Commando Senior’s house but many of them are a mystery to us. I hope the mysteries will become pleasant revelations as you sort through things. Commando Senior? I assume you are married to Commando Junior as I recall him referred to in your posts. Thanks, Marie. I am married to Commando. Commando senior was his father and Commando Junior is our youngest son, the image of his father and grandfather. Ah, I get it! Thanks for setting me straight about all the Commandos in your family. What a great idea. Love that Japanese teacup. The thought of your demise any time soon is greatly exaggerated I hope. (Mark Twain’s quote popped into my mind just now.) But, of course, you are right! We are but pilgrims passing through. Thanks for your anecdote here. Now I picture Kate with your wooden salad bowl. Life goes on . . . .
Marian, your mother left you a treasure with those simple handwritten notes and beautiful items. The china dish is exquisite. I feel certain that is exactly what she intended. I have journals written by my paternal grandfather to his daughter and her husband who were stationed in Texas during WWII. This all reminds me more than ever that we need to preserve the stories and artifacts of our everyday lives for future generations. The journals from your grandfather sounds like a blog post in the making – or maybe a another serious writing adventure paired with other family records after your finish Book # 2. Thanks for the anecdote, Kathy. You are always welcome here! Beautiful. Thank you, Mariann. You inspire me to leave notes. I’ve been avoiding the larger job of labeling all Vic’s photos. It’s too big a project and I keep choosing the next thing I’m writing. In truth, I’d find treasures of good stories if I sorted through these things. My great-grandmother labelled everything with names, but sadly no notes or history. My Mom knows the history of some things, but I’d better get her to write it down. It is so wonderful to read your legacy. Thank you for sharing.